A few days back, a shocking news made its place on the front page of almost every newspaper across the country. It was regarding the conviction of a class eleven child in charge of murdering a class two schoolmate. Putting to rest the questions over the intelligence of case investigators, the child confessed his crime too. Such incidents raise serious questions over the diminishing input of moral values in the children. Children are, as we know, like we clay, who can be molded in any shape with the nurturing. The good and evil both encounter these little heroes every day when they face the world outside. From the neighbours to the school bus driver, from the school friends to the house help and from the teachers to family members everyone leaves their impression on your child every day. In such case, what the child should learn and should not learn from them needs to be managed. I remember, how little bedtime stories had a deep impact on my thoughts and deeds which my parents or grandparents used to tell me before I sleep. In almost all of those stories, there was a positive and inspiring moral lesson inherit. Sometimes, I was proactively told about what the lesson we can learn from that story while sometimes I was asked, “So, what does this story teaches us about?” I used to answer this with much zeal and enthusiasm at least when the story was a repeatedly recited one for me. Those moral learnings from stories had a deep impact on my thoughts and actions. Suppose a story last night for me taught about not telling a lie, I was certainly hesitating telling a lie from next day because of something that was placed in my mind about bad consequences of lying. Those were days when children used to spend time with grandmas and grandpas at home. Parents also had enough time to spend with their children and developing moral values in children was a duty of everyone. Children were also explained about briefs from Gita and Ramayana where they could find most significant moral values for life. With the change of time and way of life, children have limited or no time spent with elderly people like, grandparents, to tell them stories full of moral lessons. Also, in the practical world, there is lack of any appreciation, recognition or reward for strong moral values if a child practices them making no reinforcement for them to behave morally. Most children these days are burdened to manage high academic grades, perform well in at least one sport, do well in arts like music or dance or painting etc. A few of them don even understand why is this all such highly competitive around and what is the purpose of such target bound life. Somewhere around this time, we need a part of the curriculum of our child that teaches them moral values for life. These few minutes efforts would replenish the need for grandparents’ stories, parents’ lessons and due encouragement to choose the good over the bad in them. In this way, the children would be able to choose the right path for them whenever they come across a situation of a clash between self-benefit and ethically correct behaviour. We have a procedure of sending the children to moral counsellors if they commit a crime considering them as juveniles. However, I believe all children should be given moral lessons simultaneously with their academic lessons. After all, it can prevent many moral and legal crimes that children often commit to lack of adequate ethical guidance. 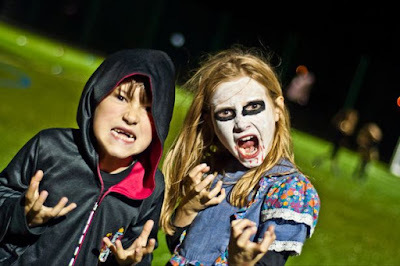 Ugly pumpkins, ridiculous costumes and over-the-top makeup, trick or treating for kids and scary themed parties for the adults, the story of Halloween runs deeply in the Western culture. And these days I have been observing a flood of Halloween posts in my social media accounts . "10 ideas to celebrate Halloween with your kids..", "10 craft projects for Halloween..", "10 things to do at Halloween night.." There are parties happening for Halloween. Costumes are getting sold. Myriads of contests are posting spooky pictures and asking to share even more ghostly pictures. And amidst all this, I am puzzled, baffled and tickled. I don't know if this is the notion of globalization or a modest thought to adopt cultures regardless of the geographical borders. Howbeit, I am sure about one thing that I hate the idea of kids celebrating Halloween here in India. 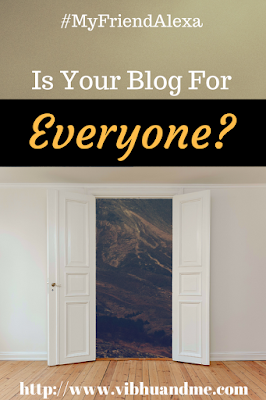 #MyFriendAlexa - Is Your Blog For Everyone? Two months back, I joined a new company as a software project manager. And with this, I also shifted to a new city. I could not write much during this shifting time, as there were many other things that needed my attention on priority. With a new job, new city and a new house, I faced challenges of finding a new school for my kid, a new market where I can buy staple items and a new setup for my family which was in habit of living a comfortable life in Delhi. #MyFriendAlexa I took as an opportunity to proffer life back to my blog which was the most neglected entity of my world during this movement and adjustment span. My target is to write 8 posts for #MyFriendAlexa campaign in which 4 will make you a bit more compassionate person, and remaining 4 will make you more informed. This post is for #SiblingStories blogging train hosted by Ila Varma in collaboration with the Brand Ang Tatva. Thirty three esteemed bloggers from blogging fraternity have joined hands to participate in the Blog train for #SiblingTalk reviving the sweet and tickling hours spent with loving siblings and revive golden memories of the past. My name is Shipra and I am a working mother who is a part time blogger as well. I share my parenting experience through my blog and I also love to write about food, health and technology. Cartoon making is another thing I really enjoy and I own a cartoon series #VibhuAndPapa that you can find on Twitter. They are the funny conversation between my son and my husband. Work line wise, I am a software project manager who now a days is working on Digital Accessibility. My this year's #MyfriendAlexa post are about making our blogs accessible. Check them if you like to know more.